TL:DR I want to lead today’s post with a big giant thank you to GrandadIsAnOldMan and his Bargain Store Project #32 Styrofoam Cup and Plate Hovercraft. In addition to stripping down more objects from the stash, both the hovercraft (success!) and jet car (fail.) were attempted on Thursday. The hover craft was updated with construction paper bought to decorate BrushBots but who’s looking… On Monday I’ll be doing prep for Wednesday’s event. 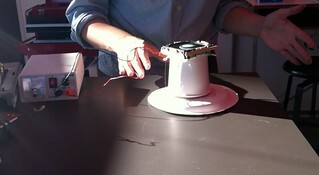 First thing was to grab a fan from a hard drive enclosure that fit into a paper cup and glue it in. This was the fail part. No way this thing had enough lift, but I was a little too concerned about finding one that went into a cup completely, corners and all, since I didn’t have a round scaffolding like GrandadIsAnOldMan did (he ends up using a hair dryer fan). Round maters because of turbulence. Next I taped the cup to a sleeve which I had glued to a plate. No go. I suspected as much. Hence the tape. Fan getting glued on to larger cup. 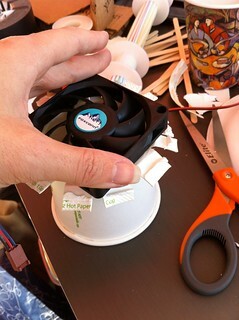 The fix was to glue a larger fan onto a larger cup with it’s base cut off and fanned out. This took way too long to occur to me. That does work, once glued onto the same sleeve the old one was removed from. 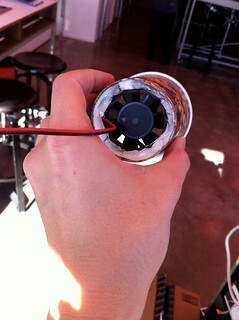 Visible are the coffee stirs I used to prevent my fingers from burning while glueing the tabs up onto the fan. 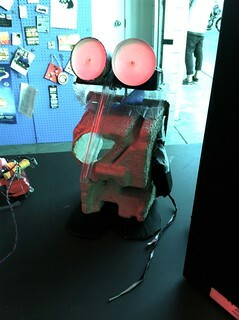 There is video of the unadorned hoverbot, too. 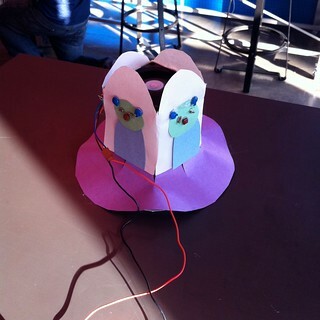 Decorated with free-hand cut construction paper and misc components. I used the paper because anything too heavy would mean no more hover lift. Unlike the tutorial I was copying I had paper plates (much heavier than styrofoam), and had picked a small plate (less surface area to help create lift, my bad). I doubt mine will be able to lift batteries like his does. I’ll make it a leash. 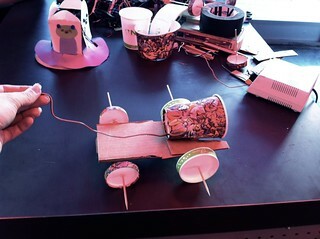 Underpowered “Jet” car made from paper cups, cardboard, skewers and pens. 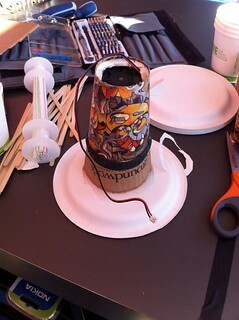 Still had that other fan in the cup, and, with more optimism than sense, tried to create the jet car. It doesn’t go from fan power, but it does roll. I used pen tubes pilfered from the store stash… sorry Tom, Darren and Xanthene! I’ll bring you new ones! I’ll find a bigger fan for this one, too. Barb swung by in preperation for her event next week and told me about bigger cups hidden in the back. With a little tape a set of wheels I screwed up by gluing them into the wrong axel became new eyes for Horatio. 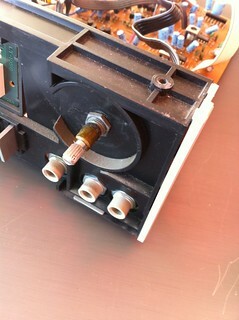 There are a couple more pictures in the set of a multi-ganged dual shaft potentiometer knob from an old stereo knob. This digikey product might be a comparable replacement part.